EU leaders, officials, lobbyists and members of the Brussels press will be able to enjoy a semi-covered pedestrianised agora, complete with green areas and an event space, once works are completed some time in 2019. Right now the ‘heart of the EU capital’ offers uninspiring steel-and-glass architecture, crawling cars and a maze of road signs and traffic lights. Belgian mobility minister Pascal Smet said on 8 December that “Schuman square is the epitome of what Brussels no longer needs to be. Today, the roundabout will be returned to Brussels’ citizens and European and will become an urban agora and a meeting place”, adding it will show how a “city of cars will turn into a city for the people”. 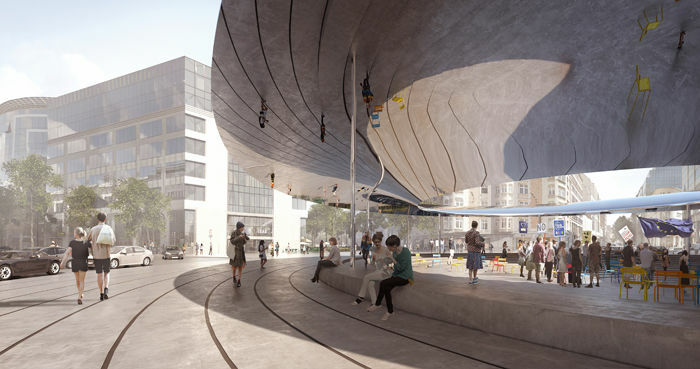 The project, put forward by Brussels architecture bureau BRUT and Danish counterpart COBE, envisages an area covered with a mirror roof, reminiscent of the design of the European Parliament’s main Spinelli building. 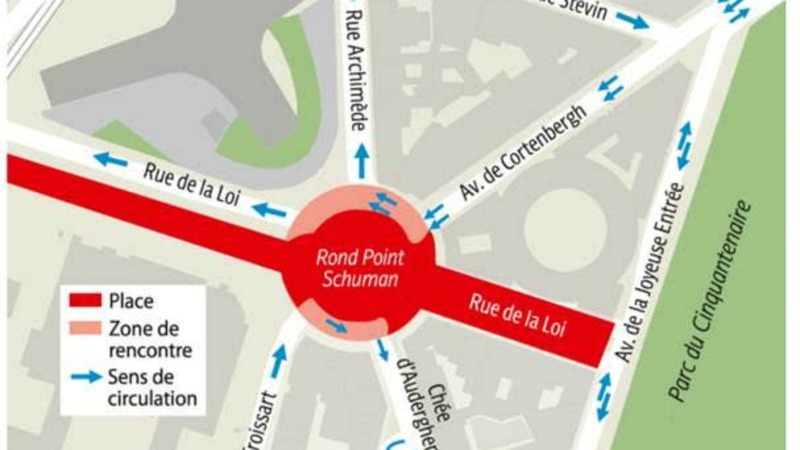 Traffic flow will be slightly altered as the only part of the current roundabout to be preserved will be the road between Cortenbergh Boulevard and Rue de la Loi. The Belgian government carried out a mobility study in tandem with the design hunt. “This way the whole zone from the Schuman square and the European buildings, up to Cinquantenaire Park will become a pedestrian zone,” said BRUT architect Francis De Wolf. The Belgian government announced the design competition at the end of 2015 and has now followed the advice of the expert group, which picked the winner from 20 submissions. First works are expected to start in the first half of 2019, utilising a budget of €7.7 million. Brussels city authorities – acutely aware of the negative image of the city’s European quarter – are planning to give the Schuman roundabout a facelift, complete with a new pedestrian zone. More artistic impressions of what the roundabout could look like can be found here. It would be the first time that the Belgians get something right in Brussels urban planning. Given that the same deciders as always are in the picture I am not holding my breath. The gigantic screw-up that is the Brussels downtown pedestrian zone should be a warning. Put the Commission in charge and exclude any Belgian politician.